It’s 1:30 in the afternoon, and our class is preparing for language arts block. Recess and lunch seem like hours ago, and we still have an entire content area to teach. As my co-teacher and I begin setting up for the lesson, we notice Jenna rocking in her seat, Daniel tapping his pencil incessantly, and Christian gone—signed out to use the restroom yet again. Suddenly we realize what all these bothersome behaviors have in common: movement. In talking over our observations, my co-teacher and I reminded each other how important movement is to humans—especially children. Movement increases oxygen and blood flow, enhancing alertness and helping students keep bodies and minds engaged in the task at hand. And because movement activities can be fun and engaging for all members of the class, they help create a positive learning community. Plus, movement included during lessons can reinforce the skills being taught. Far from interfering with learning, movement actually increases it. After that bumpy afternoon, my co-teacher and I focused on giving students more opportunities to be active throughout every day. When they’ve been sitting too long, we offer a quick energizer for a brain and body break. We add extra movement as we transition from one activity to another. And we build movement right into many of our lessons, using it to preview, teach, or review content or skills. Here’s one quick, easy way we build productive movement into our teaching. You’ll find it readily adaptable to whatever grade you teach. On one side, write the question number. On the other side, write the question. 2. Tape the question cards throughout the room with the number side up. 1. Have students number their answer sheets. Leave your answer sheet and pencil at your desk. Walk through the room looking for question cards. When you arrive at a question card, flip it over, read the question on the back, and figure out the answer. Return to your desk to record the answer on your answer sheet. 3. Students continue until they’ve answered all questions. Know your students. Would discussing the answers with one another help them learn? Would students benefit from keeping a clipboard with them throughout the activity, rather than going back and forth to the answer sheets on their desks? Do whatever will work best. Students need not answer the questions in order. 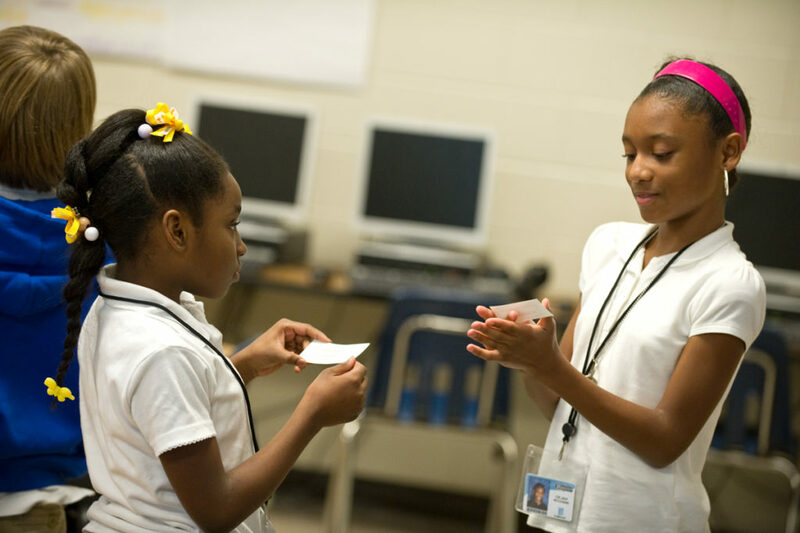 Encourage them to move to question cards not crowded with other students. Remind students to carefully record their answers next to the correct number on their answer sheet. Andrew Moral teaches sixth graders at Sol Feinstone Elementary School in Newtown, Pennsylvania. He is a Responsive Classroom consulting teacher.